The 2005 election of Evo Morales as the president of Bolivia marked a moment of celebration for the social movements who backed the rise to power of the Movimiento al Socialismo party (MAS – Movement for Socialism), with Morales as its leader. Morales adopted discourses derived from popularly supported Buen Vivir, alternatives to development, social and solidarity economies, and other forms of localized political and economic autonomy, creating a politics of possibility around such proposals. However, despite initial commitments and actions taken by Morales to improve well-being without replicating historically unsustainable and destructive pathways to industrial development, Bolivia continues to be characterized by fiscal dependence and macroeconomic prioritization of growth-centric policies sustained by extractive activities. In addition, the country is now rife with socio-environmental conflict. 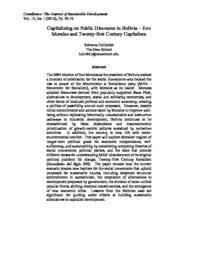 This paper will explore Morales’ neglect of longer-term political goals for economic independence, self-sufficiency, and sustainability by considering competing theories of social movements, political parties, and the state that provide different lenses for understanding MAS’ abandonment of its original political platform for change, Twenty-First Century Socialism (Socialismo del Siglo XXI). The paper reveals how the current scenario creates new barriers for the social movements that continue to uphold proposals for sustainable futures, including deepened structural entrenchment in extractivism, the cooptation of alternatives to development proposals by government, the division of once-unified popular fronts, shifting electoral constituencies, and the emergence of new economic elites. Lessons from the Bolivian case are significant for guiding wider efforts at building sustainable alternatives to capitalist development.